Class IIIB liquids shall include those with flash points at or above 200ºF (93.3ºC). This section does not regulate Class IIIB liquids. Where the term “Class III liquids” is used in this section, it shall mean only Class IIIA liquids. It should be mentioned that flash point was selected as the basis for classification of flammable and combustible liquids because it is directly related to a liquid’s ability to generate vapor, i.e., its volatility. Since it is the vapor of the liquid, not the liquid itself that burns, vapor generation becomes the primary factor in determining the fire hazard. The expression “low flash – high hazard” applies. Liquids having flash points below ambient storage temperatures generally display a rapid rate of flame spread over the surface of the liquid, since it is not necessary for the heat of the fire to expend its energy in heating the liquid to generate more vapor. A material’s flammable or explosive limits also relate to its fire and explosion hazards. These limits give the range between the lowest and highest concentrations of vapour in air that will burn or explode. The lower flammable limit or lower explosive limit (LFL or LEL) of gasoline is 1.4 percent; the upper flammable limit or upper explosive limit (UFL or UEL) is 7.6 percent. This means that gasoline can be ignited when it is in the air at levels between 1.4 and 7.6 percent. A concentration of gasoline vapor in air below 1.4 percent is too “lean” to burn. Gasoline vapor levels above 7.6 percent are too “rich” to burn. Flammable limits, like flash points however, are intended as guides not as fine lines between safe and unsafe. A material’s auto ignition or ignition temperature is the temperature at which a material self-ignites without any obvious sources of ignition, such as a spark or flame. 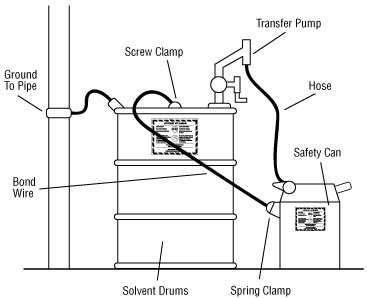 Bulk storage of gasoline or diesel are kept in above ground tanks. Tank areas are diked to contain accidental spills. Tanks shall be labeled IAW NFPA guidelines. All tank areas shall be designated no smoking – no hot work – no open flame areas. No flames – hot work or smoking is be permitted in flammable or combustible liquid storage areas. Solvents and fuels produced from petroleum (e.g., benzene, toluene, mineral spirits, gasoline, jet fuel) can build up a charge when they are poured or flow through hoses. They tend to hold a charge because they cannot conduct electricity well enough to discharge when in contact with a conducting material, like a metal pipe or container, that is grounded. When enough of a charge is built up, a spark may result. If the vapour concentration of the liquid in air is in the “flammable range” and the spark has enough energy, a fire or explosion can result. At higher elevations in the mountains, the air pressure is significantly lower and solvents boil at lower temperatures. Under these conditions, the flash point and the temperature for the optimal vapour/air ratio are lower and some “combustible” liquids can become “flammable”. A liquid like hexanes has a low flash point and it is flammable when its temperature is in the range -33°C to -3°C (-28°F to +26°F) at sea level. At normal room temperatures, the vapour/air ratio at the surface of the solvent will be well above its upper flammability limit and would be “too rich” to burn. However, at some distance away from the solvent surface, there is a concentration of hexane vapour in the air that is in the flammable range. Generally, the conditions for igniting a liquid are optimal when the liquid is used at a temperature that produces a vapour in air concentration (at the surface of the liquid) that is halfway between the upper and lower flammability limits. Recognizing that these conditions represent an “optimal” fire hazard, one has to take appropriate precautions. In the flammable liquid storage and dispensing area, ground dispensing drums. Grounding is done by connecting the container to an already grounded object that will conduct electricity. This could be a buried metal plate, a metallic underground gas piping system, metal water pipes or a grounded, metal building framework. Bonding both containers and grounding one of them “drains off” static charges and prevents the discharge of sparks. All grounding and bonding connections must be bare metal to bare metal. Remove all dirt, paint, rust or corrosion from points of contact. Specially designed and approved bonding and grounding wire assemblies are available from safety equipment retailers. There are tables in the standard summarizing the storage requirements applicable to “General Purpose Public Warehouses.” These tables refer to indoor storage of flammable and combustible liquids which are confined in containers and portable tanks. Storage of incompatible materials that create a fire exposure (e.g., oxidizers, water-reactive chemicals, certain acids and other chemicals) is not permitted. The last type of inside storage covered by this paragraph addresses storage in “warehouses or storage buildings.” These structures are sometimes referred to as outside storage rooms. Practically any quantity of flammable and combustible liquid can be stored in these buildings provided that they are stored in a configuration consistent with the tables in this paragraph. Stored material shall not be piled within 3 feet of beams or girders and shall be at least 3 feet below prinkler deflectors or discharge orifices of water spray, or other fire protection equipment. Requirements covering “storage outside buildings” are summarized in tables in this paragraph. Associated requirements are given for storage adjacent to buildings. Also included are requirements involving controls for diversion of spills away from buildings and security measures for protection against trespassing and tampering. Certain housekeeping requirements are given which relate to control of weeds, debris and accumulation of unnecessary combustibles. Polymerization is a chemical reaction in which many small molecules (monomers) join together to form a large molecule (polymer). Often the reaction produces heat and pressure. Industry carries out these processes under closely monitored conditions. Other chemicals (catalysts and initiators) and controlled amounts of heat, light and pressure are often involved. Vigorous polymerization is potentially hazardous because the reaction may get out of control. Once started, the reaction is accelerated by the heat that it produces. The uncontrolled buildup of heat and pressure can cause a fire or an explosion, or can rupture closed containers. Depending on the material, temperature increases,sunlight,ultraviolet (UV)radiation, X-rays or contact with incompatible chemicals can trigger such reactions. An inhibitor is a chemical that is added to a material to slow down or prevent an unwanted reaction such as polymerization. Inhibitors are added to many materials that can polymerize easily when they are pure. Inhibitor levels in materials may gradually decrease during storage even at recommended temperatures. At storage temperatures higher than recommended, inhibitor levels can decrease at a much faster rate. At temperatures lower than recommended, the inhibitors may separate out. This action can result in some part of the material having little or no inhibitor. Some inhibitors need oxygen to work effectively. Chemical suppliers may recommend checking oxygen and inhibitor levels regularly in stored materials and adding more if levels are too low. Vapours from inhibited materials do not contain inhibitors. If these vapours condense and form polymers, they can block vents or flame arrestors in process equipment or containers. Condensation is a chemical reaction in which two or more molecules join together to form a new substance. Water or some other simple substance may be given off as a by-product. Some polymers, such as nylon, can be formed by condensation reactions. Vigorous condensation can produce more energy than the surroundings can safely carry away. This could cause a fire or explosion, or rupture closed containers. Few common pure chemicals undergo vigorous condensation by themselves. Some members of the aldehyde chemical family, including butyraldehyde and acetaldehyde, condense vigorously, but bases or sometimes strong acids must also be present. Some commercial products sold to be mixed for specialized applications may undergo vigorous condensation if they are not stored, handled and used as directed by the chemical supplier. Decomposition is a chemical change in which a molecule breaks down into simpler molecules. Vigorous decomposition is potentially hazardous because large amounts of energy can be released very quickly. This could result in a fire or explosion, or rupture a closed container causing the release of dangerous decomposition products. Some pure materials are so chemically unstable that they vigorously decompose at room temperature by themselves. For example, some organics are relatively safe only when refrigerated or diluted. Some materials can react vigorously with water to rapidly produce gases which are deadly at low airborne concentrations. For example, sodium or potassium phosphide release phosphine gas when they contact water. Alkali metal cyanide salts, such as sodium or potassium cyanide, slowly release deadly hydrogen cyanide gas on contact with water. The cyanide salts of alkaline earth metals such as calcium or barium cyanide react at a faster rate with water to produce hydrogen cyanide gas. This can result in a life-threatening problem in confined spaces or poorly ventilated areas. Large amounts of corrosive hydrogen chloride gas are rapidly released when water reacts with aluminum chloride, phosphorous trichloride, tin chloride and chlorosilane compounds. When water contacts thionyl chloride or sulphuryl chloride, they decompose rapidly giving off sulphur dioxide gas and hydrogen chloride gas. Treat all unknown materials as very hazardous until they are positively identified. Highly reactive chemicals may undergo vigorous, uncontrolled reactions that can cause an explosion or a fire, or rupture sealed reaction vessels or storage containers. Even slow reactions can be hazardous if they involve large amounts of material or if the heat and gases are confined, such as in a sealed storage drum. Drums that are swollen and distorted from over-pressurization are potentially very dangerous. They may rupture at any time without warning and release their contents. Some dangerously reactive liquids such as methyl acrylate and acrylonitrile, are also flammable liquids. They give off enough vapour at normal workplace temperatures to form flammable mixtures with air. They can be serious fire hazards at temperatures lower than those at which they would begin to polymerize or decompose. Fires involving dangerously reactive materials can be more hazardous than normal. The heat from the fire can lead to violent, uncontrolled chemical reactions and potentially explosive ruptures of sealed containers. Well designed and maintained ventilation systems remove airborne, dangerously reactive materials from the workplace and reduce their hazards. The amount and type of ventilation needed depends on such things as the type of job, the kind and amount of materials used, and the size and layout of the work area. An assessment of the specific ways a workplace stores, handles, uses and disposes of its dangerously reactive materials is the best way to find out if existing ventilation controls (and other hazard control methods) are adequate. Some workplaces may need a complete system of hoods, ducts and fans to provide acceptable ventilation. Others may require a single, well-placed exhaust fan. No special ventilation system may be needed to work with small amounts of dangerously reactive materials which do not give off airborne contaminants. Make sure ventilation systems for dangerously reactive materials are designed and built so that they do not result in an unintended hazard. Ensure that hoods, ducts, air cleaners and fans are made from materials compatible with the dangerously reactive substance. 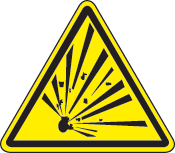 Systems may require explosion-proof electrical equipment. Ensure that the system is designed to avoid buildups of dusts or condensation of vapours. The vapours of inhibited liquids are not inhibited. When they condense, the liquid could polymerize or decompose easily. Keep systems for dangerously reactive materials separate from other systems exhausting incompatible substances. Periodic inspection of ventilation systems will help maintain them in good operating condition. Inspect all incoming containers before storing to ensure that they are undamaged and properly labelled. Do not accept delivery of defective containers. Store dangerously reactive materials in containers that the chemical supplier recommends. Normally, these are the same containers in which the material was shipped. Repackaging can be dangerous especially if contaminated or incompatible containers are used. For example, strong hydrogen peroxide solutions can decompose explosively if placed in a container with rusty surfaces. Bottles for light-sensitive materials are often made of dark blue or brown glass to protect the contents from light. Containers for water-sensitive compounds should be waterproof and tightly sealed to prevent moisture in the air from reacting with the material. Make sure containers are suitably labelled. For materials requiring temperature control, the recommended storage temperature range should be plainly marked on the container. It is also a good practice to mark the date that the container was received and the date it was first opened. Protect containers against impact or other physical damage that might cause shock. Do not use combustible pallets, such as wood, for storing oxidizing materials or organic peroxides. Normally keep stored containers tightly closed. This helps to avoid contamination of the material or evaporation of solvents used to dilute substances, such as some organic peroxides, to safer concentrations. Some dangerously reactive liquids, such as strong hydrogen peroxide solutions or certain organic peroxide products, gradually decompose at room temperature and give off gas. These liquids are shipped in containers with specially vented caps. These vent caps relieve the normal buildup of gas pressure that could rupture an unvented container. Check vent caps regularly to ensure that they are working properly. Keep vented containers in the upright position. NEVER stack vented containers on top of each other. Store dangerously reactive liquids and solids separately away from processing and handling areas and from incompatible materials. Some dangerously reactive materials are incompatible with each other. Do not store these beside each other. Separate storage can minimize personal injury and damage caused by fires, spills or leaks. Check the reactivity data and storage requirements sections of the MSDS for details about what substances are incompatible with a specific dangerously reactive material. Construct walls, floors, shelving, and fittings in storage areas from suitable materials. For example, use non-combustible building materials in storage areas for dangerously reactive oxidizers or organic peroxides. Use corrosion-resistant materials for dangerously reactive corrosives. Ensure that floors in storage areas are watertight and without cracks in which spilled materials can lodge. Contain spills or leaks by storing smaller containers in trays made of compatible materials. For larger containers, such as drums or barrels, provide dikes around storage areas, and sills or ramps at door openings. Store smaller containers at a convenient height for handling below eye level if possible to reduce the risk of dropping them. Avoid overcrowding in storage areas. Do not store containers in out-of-the-way locations where they could be forgotten. Supplied with adequate firefighting equipment including sprinklers (sprinklers may not be allowed in areas where materials that react dangerously with water are present). Free of ignition sources such as sparks, flames, burning tobacco or hot surfaces. Store dangerously reactive materials in dry, cool areas, out of direct sunlight, and away from steam pipes, boilers or other heat sources. Follow the chemical supplier’s recommendations for maximum and minimum temperatures for storage and handling. Higher temperatures can be hazardous since they can start and speed up hazardous chemical reactions. In many cases, inhibitors can be rapidly depleted at higher-than-recommended storage temperatures. Loss of inhibitor can result in dangerous reactions. Some dangerously reactive materials must be kept at low temperatures in refrigerators or freezers. Use only approved or specially modified units. These are generally known as “laboratory safe”. Standard domestic refrigerators and freezers contain many ignition sources inside the cabinet. It can also be hazardous to store dangerously reactive materials at less than the recommended temperature. For example, acrylic acid is normally supplied with an inhibitor to prevent polymerization. Acrylic acid freezes at 13?C (55?F). At temperatures less than this, it will partly solidify. The solid part contains little or no inhibitor; the inhibitor remains in the liquid portion. The uninhibited acrylic acid can be safely stored below the freezing point but it may polymerize violently if it is heated to warmer temperatures. Some organic peroxides are sold dissolved or dispersed in solvents, including water, to make them less shock-sensitive. If these are cooled to below their freezing points, crystals of the pure, very sensitive organic peroxide may be formed. Alarms that indicate when storage temperatures are higher or lower than required may be needed. Follow the chemical supplier’s directions about inhibitors used in a particular product. Where appropriate, check inhibitor and oxygen levels and add more as needed according to the supplier’s instructions. Do not keep a material for longer than the chemical supplier recommends. Open and dispense containers of dangerously reactive materials in a special room or area outside the storage area. Do not allow any ignition sources in the vicinity. Take care that the dangerously reactive materials do not contact incompatible substances. Use containers and dispensing equipment, such as drum pumps, scoops or spatulas, that the chemical supplier recommends. These items must be made from materials compatible with the chemicals they are used with. Keep them clean to avoid contamination. When transferring materials from one container to another, avoid spilling material and contaminating your skin or clothing. Spills from open, unstable or breakable containers during material transfer have caused serious accidents. NEVER transfer liquids by pressurizing their usual shipping containers with air or inert gas. The pressure may damage ordinary drums and barrels. If air is used, it may also create a flammable atmosphere inside containers of flammable or combustible liquids. Glass containers with screw-cap lids or glass stoppers may not be acceptable for friction-sensitive materials. Avoid using ordinary screw-cap bottles with a cardboard liner in the cap for moisture-sensitive chemicals. Airborne moisture can diffuse slowly but steadily through the liner. NEVER transfer materials stored in a vented container into a tightly-sealed, non-vented container. The buildup of gas pressure could rupture it. Dispense from only one container at a time. Finish dispensing and labelling one material before starting to dispense another. Dispense the smallest amount possible, preferably only enough for immediate use. Keep containers closed after dispensing to reduce the risk of contaminating their contents. NEVER return any unused material, even if it does not seem to be contaminated, to the original container. If a dangerously reactive material freezes, do not chip or grind it to break up lumps, or heat it to thaw it out. Follow the chemical supplier’s advice. Make sure that all areas where dangerously reactive liquids and solids are used are clean and free of incompatible materials and ignition sources. Do not allow temperatures in these areas to become hot enough to cause a hazardous reaction. Handle containers carefully to avoid damaging them. Keep containers tightly closed except when actually using the material. Avoid returning used chemicals to containers of unused materials. Keep only the smallest amounts possible (never more than one day’s supply) of dangerously reactive materials in the work area. Return unopened containers to the proper storage area at the end of the day and opened containers to a dispensing area at the end of the day. Check that all containers are properly labelled, and handle containers so that the label remains undamaged and easy to read. Regular workplace inspections can help to spot situations in which dangerously reactive materials are stored, handled or used in potentially hazardous ways. Read the Material Safety Data Sheets (MSDSs) and labels for all of the materials you work with. Know all of the hazards (fire, explosion, health, corrosivity, chemical reactivity) of the materials you work with. Know which of the materials you work with are dangerously reactive. Store dangerously reactive materials in suitable, labelled containers (usually their shipping containers) in a cool, dry area. Store, handle and use dangerously reactive materials in well-ventilated areas and away from incompatible materials. Follow the chemical supplier’s advice on maximum and minimum temperatures for storage and use. Follow the chemical supplier’s advice on checking and maintaining inhibitor and dissolved oxygen levels where appropriate. Eliminate ignition sources (sparks, smoking, flames, hot surfaces) when working with dangerously reactive materials. Handle containers carefully to avoid damaging them or shocking their contents. Keep only the smallest amount possible (not more than one day’s supply) in the work area. Dispense dangerously reactive materials carefully into acceptable containers, using compatible equipment. Do not subject dangerously reactive materials to any type of friction or impact. Be careful when performing operations such as separations or distillations, that concentrate dangerously reactive materials. Handle and dispose of dangerously reactive wastes safely. Know how to handle emergencies (fires, spills, personal injury) involving the dangerously reactive materials you work with. Clean-up any spills promptly and safely according to directions in the MSDS. Properly dispose of unlabelled or contaminated materials. Promptly remove combustible wastes, including wood, paper or rags from work area. Avoid any buildup of chemical dusts on ledges or other surfaces. Ensure that all waste containers used are compatible with the reactive materials, properly marked and located close to the job. *Note: For example, some commercial sorbent materials used for spill clean-up may initiate polymerization in some monomers. Do not use sawdust or other combustible sweeping compounds to clean up spills of oxidizers or organic peroxides. Remove contaminated clothing and footwear since they can be a severe fire or health hazard. Wash contaminated clothing and footwear thoroughly before rewearing or discarding. Check the MSDS or contact the chemical supplier for details. 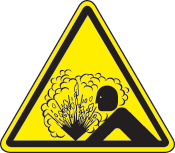 Do not wear or carry contaminated items into areas having ignition sources or where smoking is allowed. Store food and tobacco products in uncontaminated areas. Clean yourself thoroughly at the end of the workday. Only specially trained and properly equipped people should handle the emergency. Nobody else should go near the area until it is declared safe. The MSDSs for the materials used are a starting point for drawing up an emergency plan. MSDSs have specific sections on spill clean-up procedures, first aid instructions, and fire and explosion hazards, including suitable fire extinguishing equipment and methods. If the directions in each MSDS section are not clear or seem incomplete, contact the material’s supplier for help. It is very important to know the best ways to fight fires involving dangerously reactive materials. For example, using water on water-reactive chemicals can cause the rapid release of lethal gas or, in some cases, violent explosions. There are numerous other sources to turn to for help in developing your emergency plans. The local fire department can provide assistance in this area, as well as training. You can also obtain useful information at little or no cost from environmental and health and safety enforcement agencies, provincial accident prevention associations, St. John Ambulance, insurance companies, occupational health and safety groups, unions, professional associations, certain colleges and universities, and CCOHS. Private consultants who specialize in these matters are also available.